The definitive version of Ouroboros featuring exclusive vinyl mastering listening experience, cut by Chris Bellman at Bernie Grundman Mastering studios, this is definitely one of the best albums of 2016 and probably one of the best sounding new releases this year will present us! 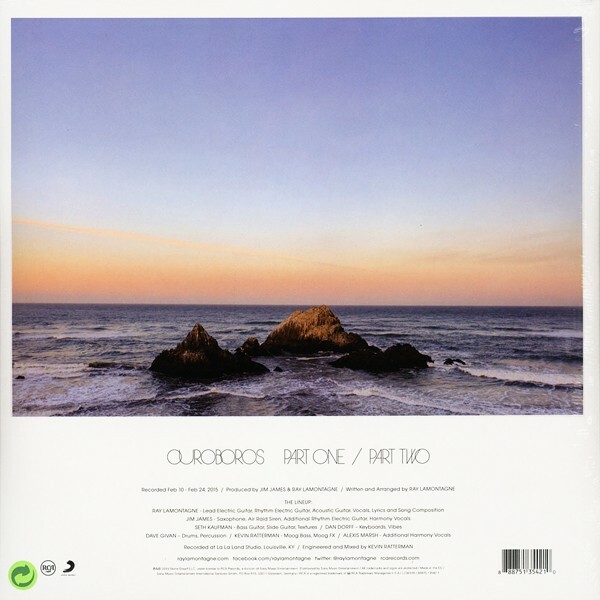 With production colaboration from Jim James, Ouroboros moves deeper into the psychedelic haze. Ray LaMontagne came off the yearlong tour behind 2013's Supernova with around 18 songs he'd stockpiled prior to going on the road with the intension of developing the best of the new material for the follow-up LP. The Louisville sessions with co-producer My Morning Jacket auteur Jim James had already been booked, and LaMontagne had less than three months to get the new batch ready to cut. "I dug into the songs for six weeks, but the current wasn't there," he recalls. "At that point, you have to open up the top of your head and just let it all in, but the direction was still unclear to me. One night, I went to bed but couldn't sleep, because I was so preoccupied with what I was trying to do. When I finally did fall asleep, I had this vivid dream – I dreamt I was working in my home studio, and the music presented itself to me. I woke up feeling that it was all there, every word and every note. But it wasn't an album of songs – it was one thing. When it materialized, I felt strongly that it wanted to exist through me. It wanted to inhabit a particular space; I sensed it had that transportive quality music possesses when it really works. It reminded me of Talk Talk's Spirit of Eden and Laughing Stock. I called Jim and described the experience, and he told me he'd just bought Spirit of Eden and was thinking we should do something with that same spirit of exploration. He adds, "So I very quickly made a 40-minute demo and sent it to him. After he heard it, Jim told me that that was the album, and I should release it just as it was. It was just me in my studio with no percussion, just guitars and vocals. I resisted the urge to do that – the demo was a sketch, and I needed to bring to into three dimensions. Jim and I wanted to make something beautiful, and when we played the first song in the studio with the band he'd put together, we all knew we had it already – it was speaking through the players. The album we made is the demo, note for note. The demo was very specific – it felt like a complete arrangement – and the parts on the album are the parts on the demo. It all just fit together like a puzzle. Still, there were a lot of questions in the beginning of the sessions, and when there were sounds or textures I didn't know how to create, it was great to have Jim, who could translate the nuances sometimes better than I could to the players." 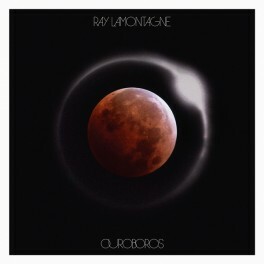 LaMontagne titled the album – his sixth – Ouroboros, after an ancient symbol depicting a serpent eating its own tail. The new LP is his second straight collaboration with a kindred spirit. Prior to teaming up with James, he'd joined forces with Dan Auerbach of the Black Keys on Supernova. What the two albums have in common is a radical expansion of the standard singer/songwriter's palate to encompass Floydian dreamscapes and supercharged bursts of electric guitar – but beyond these parallels, Ouroboros is a very different animal from its predecessor. "Supernova was childlike and mischievous, like watching kids play," LaMontagne offers. "This record feels deeper and closer – but it took me a while to translate it. The thing is, it's not up to me. I let the songs dictate when they want to exist; I don't force it. When it comes, it's like Peter Pan knocking on the window." He approached this alchemical process from another angle in a message to fans. "The album is merely an attempt to recreate, from memory, the landscapes, the colors, the sights and sounds that were experienced," he wrote. "I only thank God for the vividness of those experiences, and for the ease of their recollection." LaMontagne plays the electric guitar leads while James plays rhythm and provides harmony vocals. They're joined by Dan Dorff on keys and vibes, Kevin Ratterman on Moog and Dave Givan on drums, all James regulars, as well as multi-instrumentalist Seth Kaufman, the lone carryover from the Supernova sessions, on bass and slide. The music spun out by these six simpatico virtuosos is richly textured and strikingly dynamic – LaMontagne accurately describes it as "weightless and heavy at the same time."